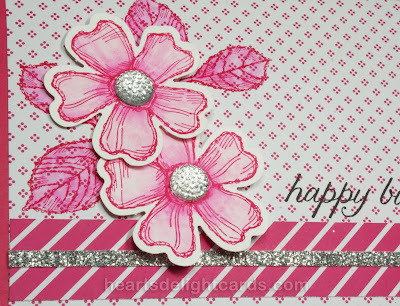 Still using up that retiring Pop of Pink Specialty DSP! If you think about it, you can get 72 cards out of one pack of Designer Series Paper, just by using it as a 4" x 5-1/4" background. That's a lot of cards! And if you use smaller pieces or strips, it will go even further. I just checked this morning, and the it's still available at 40% off. Of course, all the retiring things end in one short week! 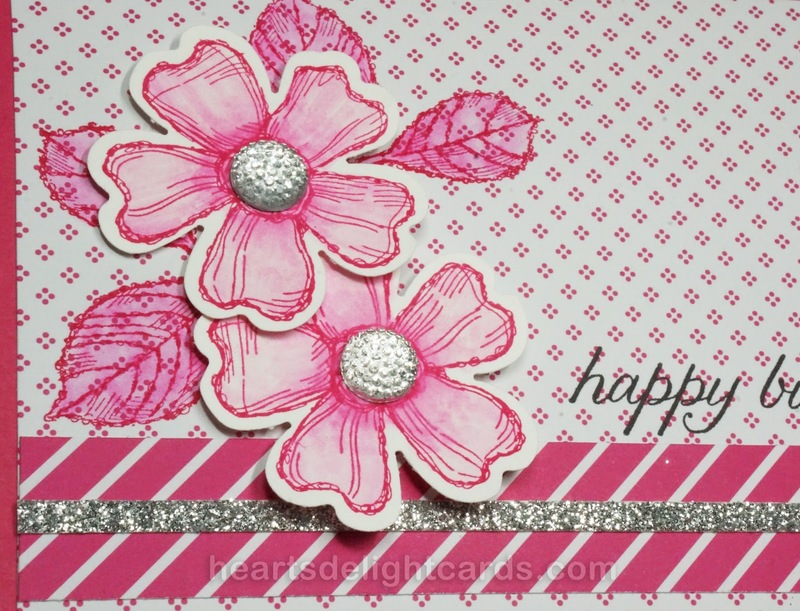 Flowers: Whisper White 2" x 4"
Background: Pop of Pink Specialty DSP 4" x 5-1/4"
Strip: Pop of Pink 3/4" x 5-1/4"
Glitter strip: Silver Glimmer Paper 1/8" x 5-1/4"
Card base: Melon Mambo 5-1/2" x 8-1/2" scored & folded at 4-1/4"
Attach glimmer strip to center of DSP strip. 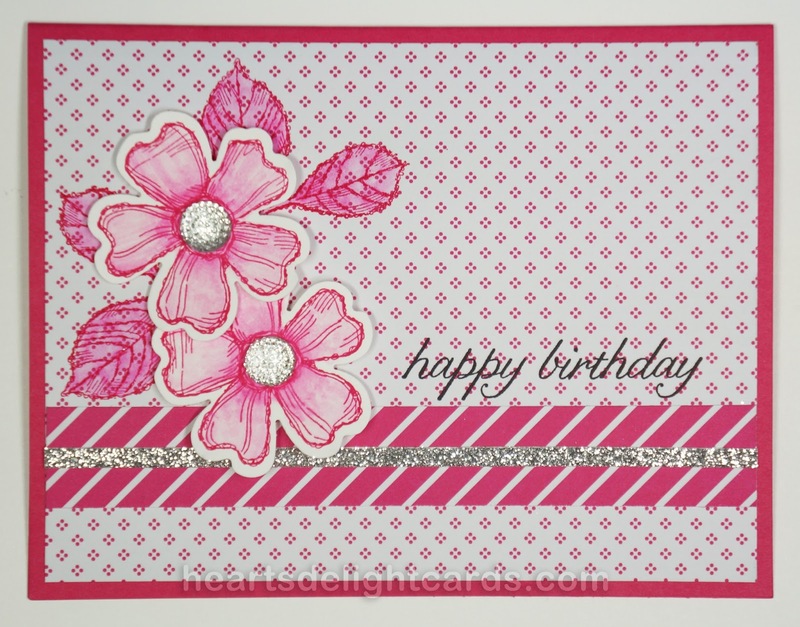 Stamp leaves (twice) in Melon Mambo on background as shown and use a Blender Pen to pull color from the stamped lines into the leaves. 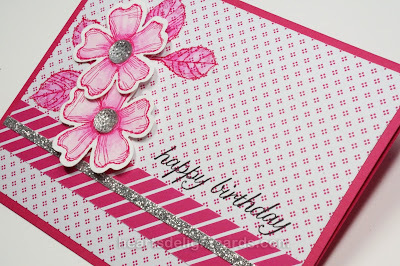 Punch blossoms with Pansy Punch and adhere to card with Stampin' Dimensionals. Add Clear Faceted Gems to centers of blossoms. 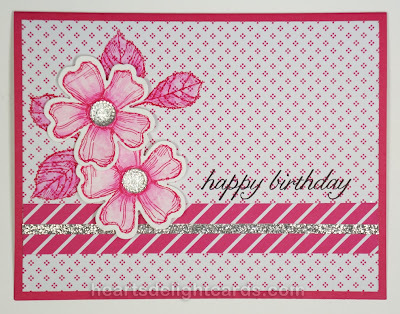 Stamp greeting in Basic Black above DSP strip on the right side.